So I am currently getting together thing for comic con in november! I was first thinking of going as Sailor Moon - especially as I am thinking of dying my hair yellow. However as me, Pawl and Aurora are all going we decided on a family costume. We have decided to do sleeping beauty theme! I have ordered a princess pink outfit for Aurora and I am currently in the middle of crafting my own Maleficent costume, Pawl will be going as Diaval. 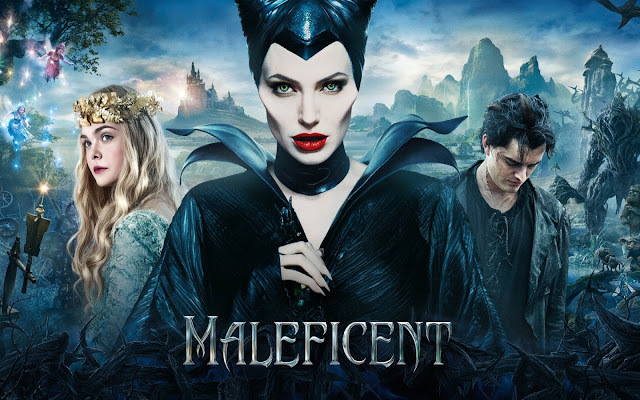 Disney's Maleficent Poster - Picture found on google. I currently have a black batwing maxi dress from eBay for the bargain price of £5 - it is actually decent quality too! This weekend I will be getting fabric for a cape and some collar work. Along with some wire and electrical tape for the head set. I need to come up with a way to make a decent staff - I think a broom handle and some imagination will really help there! I hope to make some videos to show how I create the Maleficent costume. Pawl will be wearing his black leather coat over a black top and black jeans. I want to spray his hair black to make it a bit more authentic but I am not sure he will let me! This will be my second time of going to comic con but will be my first time actually trying to create a cosplay outfit! I hope I do it justice and we all look good!